"Reasons to be Pretty" director Terry Kinney and with Neil LaBute. There are more than a few reasons to see the Broadway play "Reasons to Be Pretty," and if you are familiar with the LaBute oeuvre ("Your Friends and Neighbors," "The Shape of Things," "Fat Pig") you already knew that. The play stars Marin Ireland, Steven Pasquale, Piper Perabo and Thomas Sadoski and was nominated for three Tony awards, including Best Play. Maybe you didn't know that. 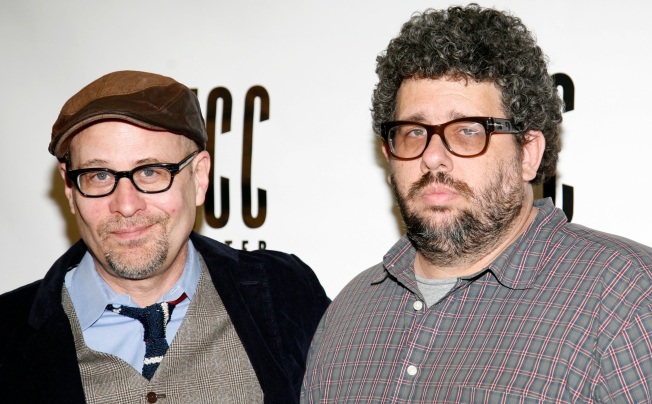 Reason number one, of course, is the wicked wit of the playwright Neil LaBute. Reason number two: LaBute will be making a rare public appearance (if you wrote a play about an overweight woman and called it "Fat Pig" you'd make like Rushdie during the fatwa, too). He'll be on stage for two public talkbacks this weekend--one after Saturday nights performance at 8 p.m., and one after the Sunday 3 p.m. show. Reason number three: Andrew McCarthy (yes, the one from the "Breakfast Club" and "Less Than Zero") will be moderating the conversation on Saturday night. Reason number four: Christopher Meloni from "OZ" will be keeping things civil during the Sunday coversation. Reason number five: Maybe you've always had a little bit of a crush on Piper Perabo. In case you don't have the 80 or so reasons needed for the ticket to the show, LaBute will also be at Borders in the Time Warner Center at 5 p.m. on Saturday, where you can assail him gratis.